To draw attention to the vibrant and diverse literary culture in the city and its environs and to raise its profile. To provide a variety of ways for audiences in the city to discover and engage with literature in a live context. Nottingham Writers’ Studio (NWS) is an active community of writers based in Nottingham’s Lace Market district. The Studio provides space and development and networking opportunities to help writers help one another get to the next stage, whatever their genre. Visit www.nottinghamwritersstudio.co.uk to find out more. Nottingham City Council has a vision for a cultural and vibrant city with the arts playing a fundamental role. For Nottingham City Council, support for the arts is seen as a way to encourage a regeneration of the economy, as well as nurturing people, creating cultural understanding, and encouraging local engagement in communities. 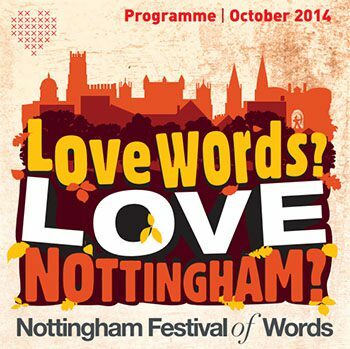 The first Nottingham Festival of Words demonstrates the benefit of working in partnership, using words to bring like-minded people together. Visit www.nottinghamcity.gov.uk to find out more. Writing East Midlands is the writer development agency for the region. They support and promote writing through services such as critical reads, bursaries and professional advice. They create opportunities for writers and run residencies and live literature events across the East Midlands. Visit www.writingeastmidlands.co.uk to find out more. The University of Nottingham offers exciting BA and MA courses in Creative Writing. Both courses are designed to allow students to develop their writing in a context which is informed directly by the experience of professional, published writers. As well as paying close attention to writing technique and honing their work in writing workshops, students get a taste of how publishing works. The latest addition to the team is novelist Jon McGregor, who is setting up a new writing magazine, based in the School of English. For more information, please visit www.nottingham.ac.uk/english. BBMC Goodword is a network of copywriters and text editors. We find the right words for people working in marketing and corporate communication, both in business and public life. And we make these words work. We also train people to become effective and imaginative writers. www.bbmc.co.uk.